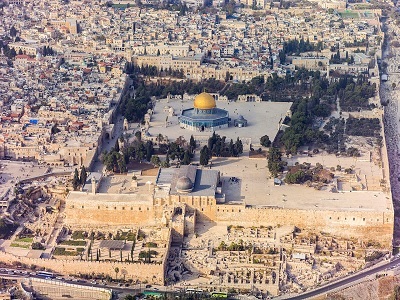 Israel’s closure of the flashpoint Al-Aqsa Mosque compound to all visitors following the shooting of a Jewish hardliner is tantamount to a “declaration of war,” President Mahmoud Abbas said Thursday. “This dangerous Israeli escalation is a declaration of war on the Palestinian people and its sacred places and on the Arab and Islamic nation,” his spokesman Nabil Abu Rudeina quoted him as saying. “We hold the Israeli government responsible for this dangerous escalation in Jerusalem that has reached its peak through the closure of the Al-Aqsa mosque this morning,” he added. The state of Palestine, he added, will carry out all the procedures needed to call Israel to account and stop these ongoing attacks. Israeli forces completely sealed off the Al-Aqsa compound for the first time in decades late Wednesday following the shooting of a far-right Israeli activist in Jerusalem. Hundreds of Muslim worshipers performed dawn prayers in the streets outside the holy site after Israeli forces closed all entrances. Only the director of the Al-Aqsa compound and security guards were allowed in. The Muezzin, who leads the call to prayer, was also denied entry. “It is unacceptable that the Al-Aqsa Mosque pays a toll for the events in Jerusalem. The mosque is a place for prayer and worship and all Muslims have the right to access it,” the director said. A spokeswoman for the Israeli police, Luba al-Samri, said that the decision was taken after evaluating the security situation following the attempted murder of Yehuda Glick. Palestinian minister of endowment Sheikh Yusuf Deis said that this was the first time the mosque had been completely sealed off since 1967. The minister said it was a “conspiracy” aimed at dividing the mosque, and criticized the move as violating the rights of Muslim worshipers. Some 500 students, who study in religious schools inside the compound, were also denied entry. Israeli restrictions on Muslim prayer at the holy site have caused tensions over the past few weeks, leading to regular clashes in East Jerusalem.